Tooth cleaning is usually accomplished by the non-surgical technique of scaling, It's typically a relatively painless procedure in which small dental instruments are used to physically remove deposits from the surfaces of teeth. At one time, scaling was performed entirely with manual tools. But in the last several decades, the ultrasonic scaler has changed all that. Many patients prefer ultrasonics to other types of scaling, possibly because it requires the clinician to use less force than a hand scaler to get the same effect. In ultrasonic scaling, only the tip of the tool touches the tooth surface, and only for a short time. It's also possible to remove deposits of plaque and tartar from under the gum line by using an extremely small tip on an ultrasonic unit, which can cause less discomfort and result in a deeper and better cleaning. 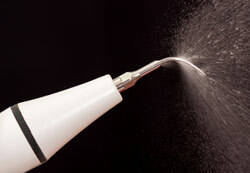 Most often an ultrasonic scaler is used first, and then any stubborn areas are scaled by hand.